Back in December last year I wrote a blog post about my goals for 2019 - so I thought I'd do a quick update and see how I'm getting on so far! I've definitely upped the fitness this year so far. We pay for our gym membership a year in advance in February, which is very good motivation to remind us how important it is we go regularly - it's a huge amount! I've been trying to get to the gym twice a week, and also going out for an outdoor run once a week. Last week I even managed a 10 km run which I'd not done for ages and found it relatively easy, so I'll be looking to continue with that distance outdoors once every couple of weeks. Then I'm aiming to increase my speed on the indoor treadmill runs. I love running outdoors at this time of year when it's warm enough to not need lots of layers, but cool enough that I don't get too sweaty and uncomfortable. I'm making good progress on my main crafting project, my Christmas ABC sampler which I want to finish by the end of the year. There are 27 boxes, one for each letter plus an extra one, and I have just three and a half to finish. Then it needs beads added and a few gold accents and it will be done. I'm hoping to get the stitching done by the end of June, and I think I can manage that if I make an effort to get on with it. Another of my goals was to do some craft evenings with friends, and I'm pleased to say that has been very successful! I hosted an evening where we did diamond painting and then we made beaded bracelets at another friend's house. 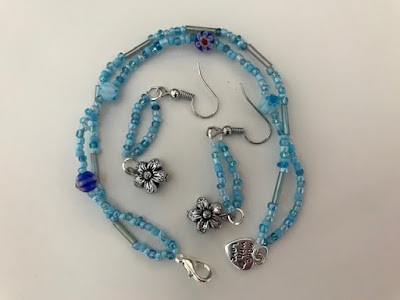 I love my bracelet and matching earrings, I'd never done any jewellery making before so it was really fun to try, and it's given me some ideas for new projects. I've slacked off a bit with my blogging lately. One reason is that I have picked up some work from a home working company which has been filling my time, and also I've been suffering a bit from bloggers block. Sometimes I feel that there are so many bloggers out there now, saying more than I could ever say and putting it much better than I can. I'm also finding it more difficult to blog about the children and family issues. I don't want to embarrass the children as they get older, and don't want everything about their lives shared online. I need to have a good brainstorm and think about the direction that I want to go in! We've not made much progress here yet, although I've started calling some fencing companies as we need some repairs done, and hopefully we can get some quotes for a new side gate. The trouble is that we'd rather spend our money on travelling than home improvements! I do continue to declutter and the house isn't looking too bad at the moment, although it could definitely do with a good spring clean! Did you set 2019 goals? How are they going? Thank you! Yes I think that's a great idea from Sarah, I think I may take advantage of it at some point!